Downtown Sonora “Where it All Happens” host a large assortment of events each and every season. Kicking off with, the Spring Festival and the Annual Celtic Faire, then to our Sonora’s Certified Farmer’s Market and Mother Lode Fair, and ending with the festive Christmas Parade. Also don’t miss our night life heating up during “Magic of the Night” or the “2nd Saturday” Events. Just to name a few. Sonora has something for everyone’s season. A Special Event Permit is required for any public or private event to be held on city property. All Hallows banner of event outside the Sonora Opera Hall Decorating the Downtown Christmas Tree Friday Flix at the Sonora Opera Hall. 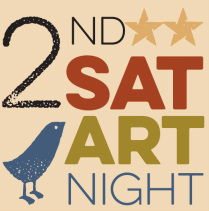 2nd Saturday Art Night @ Downtown Sonora Washington St.
Tuolumne County Women’s Network Annual Expo.